The Goldberg Variations, BWV 988, is a work written for harpsichord by Johann Sebastian Bach, consisting of an aria and a set of 30 variations. First published in 1741, the work is considered to be one of the most important examples of variation form. The Variations are named after Johann Gottlieb Goldberg, who may have been the first performer. 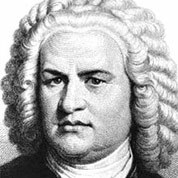 The Mass in B minor (BWV 232) by Johann Sebastian Bach is a musical setting of the complete Latin Mass. The work was one of Bach’s last compositions, not completed until 1749, the year before his death. Since the nineteenth century it has been widely hailed as one of the greatest compositions in musical history, and today it is frequently performed and recorded. In the early 1700s, Bach’s chorales enchanted listeners with their inventive harmonies, chromaticism, contrapuntal motion, and changes of tonal center. Since that time, music students the world over have studied the chorales as a paragon of “common practice” harmony and voice leading. And, by virtue of their sublime beauty, musicians continue to perform the chorales to this day.